Naturally, I’m KNITTING while watching Mad Men on DVD. In the episode “The Grown Ups”, the first scene opens with Peter Campbell sleeping on the sofa in his office, all bundled up in his coat. The story is that it’s winter, and the heat is out in the office. Lindy, his secretary, reaches a mittened hand down to wake him. Mittens! Cute mittens! I paused the DVD and got sketching. And here this pattern is the result. 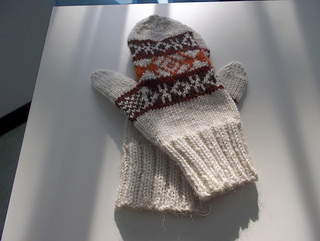 New, free pattern, Mad Men Mittens. They are as absolutely accurate to the originals as possible, except for a few rows of additional color on the thumb (to make for friendlier knitting and fit). I bought the episode on iTunes and studied the mittens frame-by-frame to get them just right.